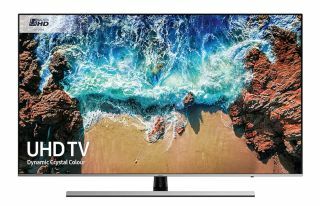 Samsung NU8000: Is this 4K TV range any good? | What Hi-Fi? While a Samsung QLED might be the pinnacle of the brand’s current 4K TV line-up, not everyone has the budget to fund one of these flagship sets. Thankfully, like most TV manufacturers, Samsung has a generous spread of 4K alternatives at a range of sizes at prices. One such range is the Samsung NU8000, which launched in 2018. NU8000 spans five different screen sizes: 49in (UE49NU8000, £709), 55in (UE55NU8000, £779), 65in (UE65NU8000, £1109), 75in (UE75NU8000, £1779) and 82in (UE82NU8000, £2679). NU8000 is classed as a premium LCD TV range, so they’re more affordable than QLED, but not quite as cheap as the brand’s 7 Series alternatives such as the NU7020 and NU7040. As you’d expect, there’s quite a big gap between NU8000 and Samsung’s 2019 QLEDs - the 55in Q90R flagship costs £2799, while even the entry level 55in Q60R costs £1299. Compare this with £779 for the same sized NU8000 model and that’s quite a big chunk of change, especially when when you also consider the savings currently available across this range. We’ve highlighted some of these below. While the NU8000 range doesn’t harness the power of QLED, you still get a number of premium features, including Samsung’s HDR 1000, Dynamic Crystal Colour and Wide Viewing Angle tech. The NU7020 series has no such features. You might have noticed that NU8000 sits just below the NU8500 and NU8070 ranges. While NU8500 series focuses on 55in and 65in curved models, the NU8000 line-up is distinctly flat. NU8070 uses Samsung’s Supreme UHD Dimming as opposed to UHD Dimming on the NU8000. So there’s not much in it. Connectivity and features look solid for the money. HLG, HDR10 and HDR 10+ flavours of HDR are all supported on NU8000, although as is the case with all Samsung TVs, Dolby Vision is not. Compared to the 7020 range, NU8000 also has Billion Colours tech, Bluetooth audio support, a built-in woofer, more advanced game mode, twin tuners and double the number of HDMI inputs (four versus two). There's also ARC support, a pair of USB sockets and Bluetooth audio, which allows you to hook up a pair of wireless headphones for late night listening. The NU8000 range gets the same operating system and Universal Guide as Samsung’s most expensive models. You also get a One Remote control with touchpad and voice control. Our 2018 Samsung TV reviews mainly focused on premium 4K QLED models such as the QE55Q8DN while we also put its first ever 8K QLED TVs through their paces, the QE65Q900R and QE85Q900R. In 2019, the only new Samsung we’ve seen so far is the fabulous 65in QE65Q90R. Samsung does have form at the more affordable end of the market too. A number of 4K TVs have performed solidly over the years with 4K models such as the UE65MU7000 gaining five stars. This proves you don’t have to spend serious amounts of cash to get excellent picture performance. In our opinion, NU8000 sets are worth investigating but at the same time we also wouldn’t rule out a 7 Series set, if you’re happy to sacrifice bit of tech and few features.